I also had a herniated disc. It began with what appeared to be hamstring tension/pain. It took a 5K race and building a porch to take me over the edge. I couldn't sit for over 2 months. Teaching forced me to put a cot in my room in order to rest between teaching classes. I became disabled the first week of Sept. in 2008. I had surgery on October 24, 2008. Immediately after the surgery the pain lessened. In the course of 2 weeks the pain subsided enough that I was able to return to work. It is now mid January and I am back to jogging. I can lift up to 35 lbs. and things continue to progress positively. I ran 5 miles yesterday and was pain free. What ever happened in your situation. I understand you found your bulging or herniating disk, but did you have surgery, or did it heal on it's own? A herniated disc never heals. One can only hope that it shrinks enough to take the pressure off the spinal cord. I am better for the time being and have not needed any injections or surgery. There are occasional flare-ups, but so far nothing like the original pain. for the most part I go about my daily routines without much concern, but I do take care not to aggravate it by doing daily exercises and avoiding heavy lifting, etc. Here are a couple of later posts on the subject here and here. - run (7-10 miles) every other day, alternate with fast walks on other days (~2 miles). i try not to sprint even on good days. - exercises and stretches every morning (10-15 min). light stretches every evening. - take 1 glucosamine pill daily. not sure if it really does anything but that's another debate. - lots of fruits and veggies in diet and no tobacco. can't guarantee if this works for everyone but so far it has worked for me. keeps the weight down and keeps the body in motion. also consistency is important. i don't want to shock my body into something strenuous abruptly. ease into the activity and keep it consistent. my only advice is not to jump back into running full on. do some walking, then slowly pick up the pace and then ease into jogging, etc. and stop if it hurts. How can i fix back pain when doing ab exercises? After suffering from lower back pain for more than 30 years I tried yoga 4 months ago. Since then I have been to 12 classes and the pain has gone, some times for more than a week. The yoga I do is called Iyengar yoga and it works for me. My fiance keeps having lower back pains and he refuses to have it checked by the doctor. Which brings to the question: Why are men so stubborn?! Haha, kidding. :-p I’ve bookmarked this page so I can let him read it later! Thanks! 🙂 funny to listen about others debilitating pain.. i'm not alone.. some 8 months ago i was working as a mover - pianos in two guys etc.. one day i fell playing hockey and experienced 2 months of worst pain in life.. didn't have to work next half year, was swimming 5 times a week, stretching, 5 months visiting chiropractor because i misaligned my posture by sitting all the time or hopping on left leg.. after all those problems i got in best shape in my life. strenghtening especially trunk with rubber bands, small weights (3 pounds), even practicing soccer. and last week i hurt it again when palying actual game.. i wanted show up little i guess, felt like this injury is over. it's not. my right foot is numb again, lots of pain - specially morning in harmstrings. 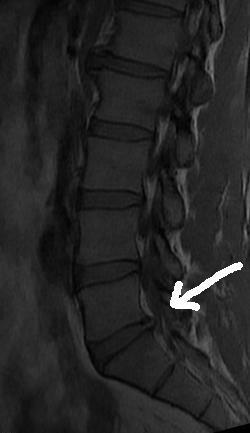 (my MRI last month showed herniated dist L4 - L5 pressing on nerve)..
i guess its same for all of us. stretching and strenghtening every damn day, i agree that yoga can do miracles but i havent started full time yet. running when moderate is good - strengthens the middle body, but for sure not sprints or 100 % long run..
was good to hear about others, thanks and good luck. My Friend is also suffering lower back pain last two year and he has join yoga classes before 2 months and he is feeling good and is pain has almost gone.